How to watch Sudani from Nigeria (2018) on Netflix Switzerland! Sorry, Sudani from Nigeria is not available on Swiss Netflix, but you can unlock it right now in Switzerland and start watching! With a few simple steps you can change your Netflix region to a country like India and start watching Indian Netflix, which includes Sudani from Nigeria. We'll keep checking Netflix Switzerland for Sudani from Nigeria, and this page will be updated with any changes. Sudani from Nigeria is not available in Switzerland BUT it can be unlocked and viewed! When a soccer club manager brings one of his injured foreign players home to recuperate, they form an unlikely bond despite their cultural differences. Their shared love of the sport brought them together. But once they're off the field, finding common ground is the goal. There is a way to watch Sudani from Nigeria in Switzerland, even though it isn't currently available on Netflix locally. What you need is a system that lets you change your Netflix country. 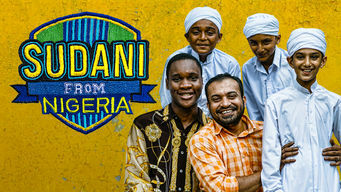 With a few simple steps you can be watching Sudani from Nigeria and thousands of other titles!